In the winter of 1926, when everybody everywhere sees nothing but good things ahead, Joe Trace, middle-aged door-to-door salesman of Cleopatra beauty products, shoots his teenage lover to death. At the funeral, Joe's wife, Violet, attacks the girl's corpse. This passionate, profound story of love and obsession brings us back and forth in time, as a narrative is assembled from the emotions, hopes, fears, and deep realities of black urban life. I like to read and listen to the story at the same time. This is the first time that I couldn't do that. For me was disappointing no the story but the fact that the autor cut some passages in the book. I was using this audio book and the reader would skip pages and it would be very confusing to follow up. What disappointed you about Jazz? This is an Abridged version of the book. The author is a master, and nothing in the book is superfluous. It's unfortunate that the audiobook is not more clearly marked as being abridged. I will be returning it. A joy to read, read again and the.n be blessed with the treat of hearing Ms. Morrison read it to one's ear. Each experience of this book reveals new dimensions of the textured characters and offers a sufficient helping of the history of the Great Migration of African Americans from the brutal South to the not so subtle prejudice and veiled segregation of the North. Jazz for me remains a staple and throughly satisfying and provoking work of literary art! Interweaving stories, layers of lives and histories, move like music, like jazz. Echoes of pain, love, origins become the whole novel -- the call and response and turning, reaching of jazz. Time is fluid. Lives blend and separate. 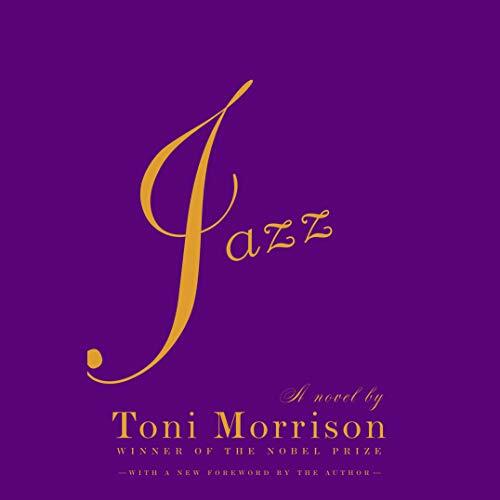 Toni Morrison merges text with music, one reflects the other in this brilliantly crafted novel that is haunting, visceral, as all great music is. Would be nice if it was the whole book. I prefer to read the book in it’s tactile iteration as I am listening to the audio version. This heavily abridged version of Jazz makes this impossible. Enjoyed it for what it was though. This book has amazingly beautiful lyrical prose, however I took a star away because the author kind of goes all over the place and it's hard to keep track of what and who the narrator is talking about or which person she's in because she switches it up a bit. Beautiful to listen to but too confusing to follow. And of course this was a Literature assignment that I have to write about now. I don't think it's going to be easy. The story is great and the narrator reads it well, the only, and biggest, problem is that the narrator skips chucks of the story. I know this because I am following along in a book. I will be trying to get my money back. Toni Morrison grabs your attention in the 1st paragraph. The jazz music enhances this sad story.